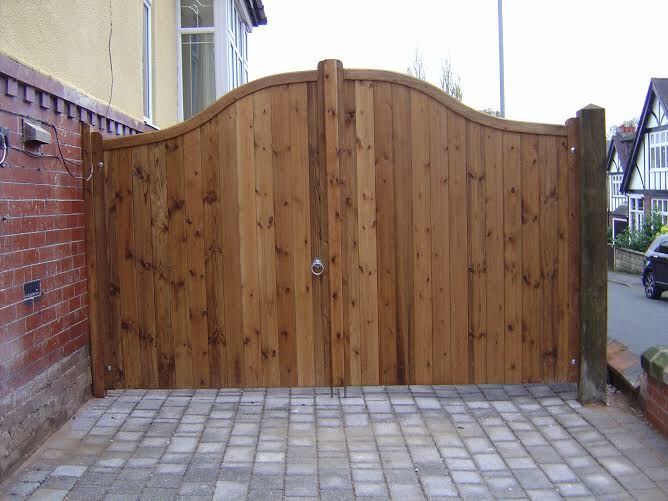 Searching for wooden gates in Manchester? Then look no further! Here at UK Gates 4 U we specialise in producing handcrafted, bespoke wooden gates in a range of designs. We use only the finest PEFC and FESC certified timber to ensure that you not only get stunning gates, but also can be assured that only sustainable timber is used. Driveway gates are an important part of both the aesthetics and security of your home and we stock a wide selection of driveway gates for you to choose from. Our driveway wooden gates are made from the finest Scandinavian, slow grown, joinery graded redwood timber using traditional stubbed mortise and tenon joint, and are available in two shades of spirit based preservation - brown and red cedar, or a clear preservative if you would prefer for your wooden gates to look untreated. Your garden gate can be a key element in the look of your garden and so we, stock a wide selection for you to choose from. Whether you’re looking for a straight top economy wooden gate or something more ornate like the concave shape of Westport gate, we’ll have something for you. All of our garden wooden gates are available in either brown, red or clear wood preservative. Whether you’re looking for garden or garage wooden gates in Manchester the process is easy. Simply pick the gate which you want, enter your measurements and we’ll make you your bespoke wooden gates to your specifications. Our products will also give recommendations on the preffered fixtures and fittings for our gates. We offer free delivery on our gates throughout Manchester and UK mainland – so getting your perfect wooden gate in Manchester has never been easier! If you have any questions please don't hesitate in contacting us. We also offer wooden gates in Stoke on Trent and the rest of Staffordshire, as well as Cheshire and Birmingham.